Sergei Galitsky opened his first store during Russia's crisis year of 1998 and has never looked back. His supermarket chain, Magnit, is opening three shops a day and has a market valuation to rival that of Europe's biggest retailer, Carrefour. Magnit has grabbed business in provincial towns from outdoor markets and kiosks, while some Western retail giants like Wal-Mart have yet to break in to Russia. Carrefour came to the country in 2009 — and has already left. Galitsky's regional focus — an unusual strategy for big chains normally seeking to gain a foothold in Russia's wealthiest markets of Moscow and St Petersburg — has allowed him to take advantage of a lack of competition. In a country where business success often comes from political connections, Galitsky is also something of an exception, steadily building his chain of stores from his first in the southern city of Krasnodar, more than 1,300 kilometers from Moscow. Under Galitsky, who keeps a low profile despite his ownership of Krasnodar's premier league soccer club, Magnit has benefited from a growing middle class and consistently higher rates of consumer spending. Russian retail sales rose 6.9 percent year on year in June, compared with 1.6 percent in Britain. Real wages rose 12.9 percent. Investors have caught on to the trend, piling money into Magnit and eschewing more established Western players held back by weak domestic economies. "We are enthusiastic about Magnit because we expect it to grow sales and earnings in a four-to-five-years perspective," said Alexei Krivoshapko, director at Prosperity Capital Management, which says it is a large investor in Magnit. "Expectations of high growth rates are fully reflected in the stock price. What is particularly attractive is its ability to grow fast and maintain high margins," said Yevgeny Golosnoi, an analyst at Nomos. Despite generating only about 10 percent of Carrefour's sales, Magnit has seen its market value jump to $11.2 billion, compared with the French company's $11.7 billion. "The likes of Magnit … can get many years of solid growth just by building stores where there aren't any," said Bruce Bower, portfolio manager at Moscow-based fund manager Verno Capital. But Verno Capital recently switched out of Magnit into archrival X5, Russia's top food retailer by sales. It was concerned that Magnit is getting too expensive, and it views X5 as a candidate for a turnaround after a year of underperformance. Magnit's Moscow-listed shares were up 31 percent in the year to date on Monday, against a 2 percent decline in the broader MICEX and a 14 percent drop in X5, which has been dogged by management and operational issues. In contrast, Carrefour, the world's second-biggest retailer by sales, behind U.S. giant Wal-Mart, is suffering from acute competition against a weak economic backdrop and had shed 23 percent of its value in 2012 as of Monday. The sharp rise in Magnit shares has inflated its valuation to a price-to-earnings ratio of 27 times for 2012, among the highest in Russia and compared with an average for Russian consumer stocks of 15.9, according to Otkritie bank. X5 and smaller rival Dixy Group trade at a ratio of 18 times and 26 times for 2012, respectively. "In this sector, value for shareholders is created by capital expenditure. ... The more stores they build, the faster they grow," Golosnoi said. 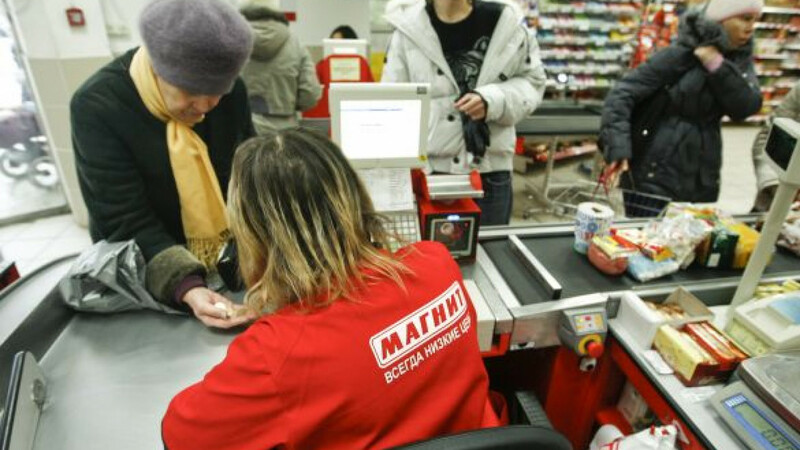 Magnit, Russia's largest food retailer by number of stores, with more than 5,700 outlets, expects sales to rise by up to 30 percent this year, backed by 1,400 new store openings. "Competition is growing every day, but we still have opportunities for more or less comfortable growth," Galitsky, 44, said on a conference call in March. He was not available to be interviewed for this story. Betting that food stores could thrive in the country's regions whatever the economic climate, Galitsky handed over his wholesale cosmetics business and founded Magnit when Russia was at one of its lowest points since the end of communism. Most of Magnit's outlets are convenience stores with basic product ranges that target medium-income shoppers, allowing it to open in small towns as well as cities. Having grown to its current size, Magnit says it enjoys roughly the same purchasing terms as market leader X5, which helps it compete on price, win customers and defend margins. "X5 is now investing in price. We won't let them remain the cheapest stores," Galitsky said in April. Galitsky is ranked by Forbes as Russia's 25th-richest man, with an estimated fortune of $4.9 billion. The former economics student and banker owns just less than 40 percent of shares in Magnit. He said in an interview in 2006 that his initial regional focus sought to avoid potential competition with foreign retail giants such as Carrefour, which he thought would naturally look at markets like Moscow and St Petersburg. Foreign retailers have had mixed results entering Russia. Germany's Metro and France's Auchan have succeeded and have many hypermarkets throughout the country, but Wal-Mart has been thwarted in attempts to enter by acquisition. Carrefour abandoned its expansion just a few months after opening a store in 2009, citing a lack of opportunities that would secure it any sizable market share, as it was pressed to concentrate on domestic issues. On Tuesday, Magnit reported a forecast-beating 142 percent jump in first-half net profit, propelling its stock 3.3 percent higher. "We've done a hell of a job!" Galitsky said in a statement. The company increased first-half net profit to $339.6 million. A Reuters poll had predicted $290 million. The result came on the back of an 86.8 percent rise in core profit, or EBITDA, to $670.6 million. 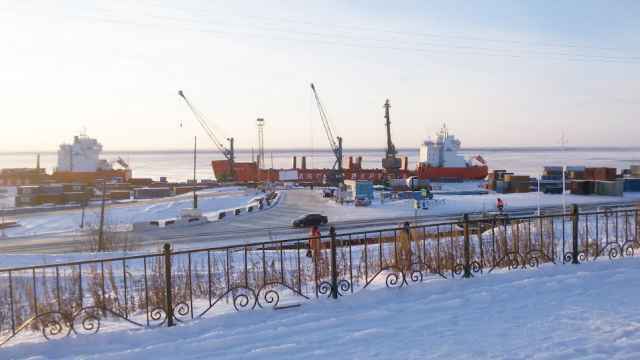 The EBITDA margin rose to 9.9 percent from 6.56 percent a year ago, the highest reading among Russian public retailers and above Magnit's full-year guidance of 7.5 to 8 percent. The company did not provide separate figures for the second quarter. According to Reuters calculations, net profit in the quarter amounted to about $182 million. The company earlier reported a 32.5 percent rise in first-half sales in ruble terms to 207.5 billion rubles ($6.48 billion) and a 3.5 percent rise in like-for-like sales.